The program is developed in accordance with the International Standards for Human Resource Management of the Chartered Institute of Personnel & Development (CIPD), UK and the European and National Qualifications Framework. The program is available in Bulgarian and English language. The program thematic areas cover the strategic role of human resources and staffing; the new roles of the HR manager as coach, mentor and consultant; training and career development; labor relations and safety management; organizational development and change; knowledge management, human capital information and people creativity; innovation and entrepreneurship in the organization. The program is structured into four terms: a preparatory module and three semesters. The preparatory module trains on policies and strategies for HR planning and management, the processes of staff recruitment, selection and retention, types of interviews, professional standards for human resource management, assessment and development centers, coaching, mentoring and consulting, best practices in human resources management, provides knowledge and develops skills for insurance, training and staff career development. In the first semester key aspects of HR employment, performance management, reward and compensation, health and safety, and pensions systems are considered and discussed. The second semester is focusing on the human resources in an international context in terms of globalization and constant change, leadership in organizations, global and national culture, quality management, project management. The third semester draws attention to employer branding as a mean of attracting and retaining talent, the conditions for talent development, the stimulus for creativity, innovation and entrepreneurship, the role of information technology and knowledge management. The program pays special attention to the role of lifelong learning and build up skills for continuing professional development through a specialized Practicum "Continuing Professional Development". 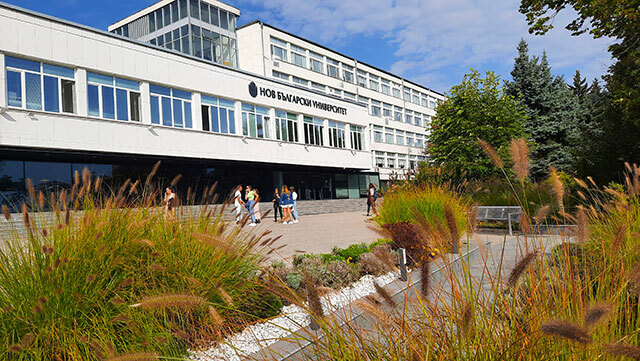 The program offers building on semester for candidates with a degree "Professional Bachelor" from the professional (vocational) field of study "Administration and Management"
The program provides an opportunity for international student mobility European program "Lifelong Learning" sectoral "Erasmus" with universities in Italy, Germany, Finland, Portugal, Turkey and other European Universities.
" quality assurance and improvement of the quality of HRM activities, including risk management. Completion of the Master program became a Master's thesis defense or the Exam after covering the required number of credits. Manner and conditions of completion are according to Standard for the completion of master degree at NBU. The process of education is orientated towards the real problems and needs of the Human Resource Management and therefore is a point of interest also for the employers. The acquired knowledge, skills and competencies will enable students to work as specialist, consultants, trainers and HR managers (companies and entrepreneurships, commodity and services production, public administration and organizations, i.e.